This article was originally published on The River of Lost Souls and is republished here with permission. When he was elected, President Donald Trump promised that he’d achieve American energy dominance by rolling back regulations on oil and gas extraction, thereby bringing jobs and prosperity back to the then-busted energy communities of the West. But a deeper look at the statistics reveal that while drilling has ticked back up since 2016, the current oil and gas “boom” remains a mere shadow of the frenzy that occurred under Obama’s reputedly burdensome policies, and the recent comeback has very little to do with Trump’s rollbacks. It’s a matter of correlation rather than causation. Something that often gets lost amongst the thicket of rhetoric around energy independence and dominance, fracking booms and environmental policy, is the fact that oil and gas, like all marketable commodities, generally follow laws of supply and demand. As demand rises relative to supply, so do prices. And as prices increase, producers drill more wells, which is the most expensive, labor-intensive, and arguably the most disruptive and destructive phase of hydrocarbon production. An oil and gas boom is really a surge in drilling, not production (though the former ultimately leads to the latter). If prices crash, drilling slows, jobs are lost, the oil patch quiets a bit but production continues from existing wells. This is why the rig count — not production figures, amount of leased acreage or even the number drilling permits issued — is typically considered the best metric for gauging the health of the industry, and the harm it’s doing. Rig counts faithfully follow the price of oil and gas — if prices go up, the rig count will too, without fail. So in order to spark an oil and gas boom, Trump would need to induce demand for oil or natural gas, thereby upping prices. Rolling back regulations on leasing and drilling doesn’t do this — at least not directly. People aren’t going to drive more and guzzle more gas just because drilling permits are easier to acquire or some oil company in New Mexico has carte blanche to vent millions of cubic feet of methane into the atmosphere, or a Wyoming producer can run roughshod over sage grouse habitat. The same goes for the corollary: Upping environmental protections on America’s public lands will not significantly affect global oil prices or tamp down demand. Regulations might affect the rig count negligibly, but only if they significantly drive up costs for the producers and the oil price is at or near the breakeven point, or the price at which drilling a new well — at a cost of $5 million to $20 million a pop — pencils out. A rule limiting methane emissions, for example, might increase a producer’s cost per barrel of oil by a dollar or two, just as shipping oil by pipeline rather than rail might save a producer several dollars per barrel. If oil prices are at the breakeven point, then this difference might be enough to make or break a new drilling project. But if prices are significantly higher or lower than the breakeven price for any given geography and producer, then a few bucks per barrel isn’t going to affect rig counts. No matter what the rig count or the price of oil is, however, environmental protections and their evisceration certainly do make a difference in the realms that really matter. Obama’s rules limiting methane and other emissions from oil and gas production would have kept millions of tons of climate-changing greenhouse gases out of the atmosphere. Trump dismantled them. The Migratory Bird Act has long punished oil companies when birds get mired down in uncovered toxic waste pits. Trump eviscerated that provision. The current administration has axed or is attempting to roll back master leasing plans, regulations on hydraulic fracturing, protections on the imperiled sage grouse, and has diminished public input on oil and gas leases. It has cut taxes on the richest of the rich — a multi-million dollar giveaway to the global corporations that are drilling America’s public lands. And yet there is little indication that any of this has caused an uptick in drilling, or has created an abundance of new jobs in the energy fields. Instead, the savings realized by the companies pad the pockets of their CEOs — like the $13.4 million salary for BP's Bob Dudley. Rig counts and oil field employment are higher now than they were two years ago, sure, but the recovery began months before Trump was elected, and the numbers are still far below the record highs of 2014, under the relatively restrictive Obama regime. That’s because price, not policy, drive oil and gas booms and busts. And that puts Trump in an awkward position now as oil prices once again take a dive. On the one hand, he wants his constituents to be able to guzzle cheap gasoline, and he actually berated Saudi Arabia — to whom he has pandered recklessly on other issues, such as killing journalists — for planned production cuts. On the other hand, he has promised the energy workers that voted for him more jobs. He can’t have both, no matter how much he ravages the environment. A — Prices collapsed in the mid-1980s and took the oil and gas industry down with them following the drilling frenzy that occurred during the energy crisis of the 1970s. But tax incentives and subsidies for unconventional extraction kept one sector alive — coalbed methane, or CBM. CBM is natural gas found in coal seams, and is plentiful in the San Juan Basin of northern New Mexico and southwestern Colorado, as well as in the Powder River Basin of Wyoming. B — In the 1990s the natural gas industry began heavily marketing its product as a “clean and green” alternative to coal and there was a natural gas power plant building surge. Growing demand resulted in higher prices, fueling a boom led by drillers in the Piceance Basin of Colorado, the San Juan Basin of New Mexico, and the Green River Basin in Wyoming. The boom got a boost when horizontal drilling and multi-stage hydraulic fracturing opened up massive shale formations to development. All of this was facilitated by the regulation-killing policies of the George W. Bush administration and the 2005 Energy Act, which streamlined drilling permitting on public lands. BB — The drilling and fracking boom resulted in a glut of natural gas flooding the markets, which combined with the global economic crisis to cause both oil and natural gas prices to crash. The big losers were natural gas producers in the West, who saw Eastern markets get taken over by producers in the Marcellus Shale formation in Ohio and Pennsylvania. C — While natural gas prices failed to rebound, oil prices jumped right back up, buoyed by growing demand from Asia. That brought the drill rigs back to the West to go after plays that previously had been inaccessible. Geographically, however, the boom was shuffled dramatically. This time, North Dakota — which had mostly been left out of past booms — became the hottest oil patch in the nation. 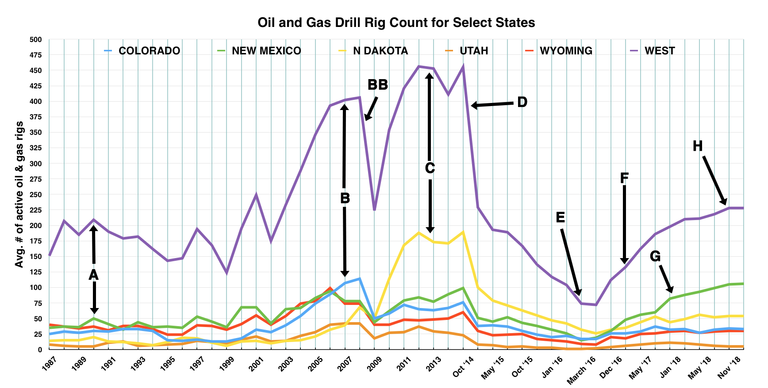 Wyoming and Colorado, meanwhile, were left with only about half as many operating rigs as they’d seen during the natural gas boom. D — Burgeoning supply from U.S. shale plays collided with waning demand from China and other global consumers. Meanwhile, Saudia Arabia and OPEC, breaking from past practice, kept on pumping oil out in high volumes, causing oil prices to plummet from a record high in summer of 2014 to near record lows just months later. Drilling rigs were packed up and put in storage, and nearly 55,000 people lost their jobs in the oil and gas extraction sub-sector. E — Global oil prices bottomed out in early 2016, and slowly began to reverse course as soon as Saudi Arabia announced a ceasefire in the price war against U.S. shale producers, meaning it would cut production. F — Trump took office in January 2017, months after oil prices — and rig counts — had begun their rebound. He immediately began attempts to roll back regulations, and also gave the Dakota Access Pipeline the go-ahead, which purportedly would result in a return of the North Dakota boom-times. G — While oil prices have gone up, they have only gone up enough to make new drilling projects in some areas profitable. That has favored producers in the Permian Basin of New Mexico and Texas where costs are lower, in part because they are closer to the Gulf Coast refineries that purchase their crude. Meanwhile, North Dakota, once the nation’s drilling hotspot, lags behind, even with crude flowing through the Dakota Access Pipeline. Employment in oil and gas extraction is up only about 8,000, or about five percent, from its lowest point in 2017. This has everything to do with prices and very little to do with policy. H — The rig-count rebound is ebbing as oil prices drop again — a possible sign of a cooling global economy. Note: This story was updated to provide a more timely example of oil company CEO pay.